The NSC Has Master Recyclers! Do you have questions about recycling or composting? Ever wonder about where you can drop your old mattress off, or how to plan for a zero-waste event? Have no fear, NSC Master Recyclers are here! Recycling brings smiles to Ashley and Hannah! Last week, two members of the National Sports Center (NSC) graduated from the Hennepin County Master Recycling and Composting class. Ashley Marston, the Sustainability Manager for the NSC, and Hannah Van Eendenburg, a Minnesota GreenCorps Waste Prevention and Recycling member at the NSC, diligently attended six weeks of classes, learning about household hazardous waste, home composting, over consumption, zero-waste events, commercial waste and recycling, and the three R’s-reduce, reuse, and recycle. Within the next year, they will commit 30 hours back into the community, implementing waste reduction and recycling projects around their communities. 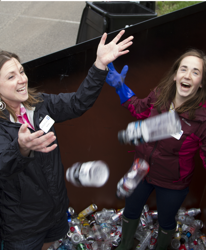 With the new information they have acquired, they are very excited to continue to assist the NSC in sustainable trash and recycling options and spread the word about the awesome recycling programs and opportunities Minnesota has! Don’t live in Minnesota? Other states, including Oregon, Washington, California, Indiana, North and South Carolina, and Vermont offer classes. Check out your county’s website for more details! Questions? Comments? Please feel free to contact Hannah Van Eendenburg at hvaneendenburg@nscsports.org or (763) 785-5647.